Yes, that’s how hard it rained. Slowly opening my eyes, I lay in bed and listened. Silence. My body clock had beaten the alarm at its own game. Summoning the will to get out of bed I drew the curtains and looked out towards North Vancouver from my dorm window. Silvery-grey clouds hung low in the dimly lit sky. No sign of rain just yet, but a quick check of the weather report assured me that would change soon. A little wet weather wouldn’t be stopping us from kayaking though. The freedom of weekends has to be seized with both hands, and so I grabbed my gear, fixed breakfast and headed for the door. Just as I was about to leave I remembered the advice from our trip leaders: trash bags. Everything within my bag was wrapped up and (hopefully) watertight, but remembering the weather forecast I picked up a large handful of spare trash bags from the kitchen before making my way downstairs. I walked out into the crisp morning air, and sure enough it was raining. Big droplets slammed into the hood of my coat as I headed round the corner to find my ride. Edward introduced himself and helped me play bag-Tetris to fit my gear in the back of the minivan. Squeezing myself into a seat between everyone else I greeted Gareth, Alice and Harriet, who all looked excited and upbeat regardless of being up so early. Then we were off to Deep Cove. 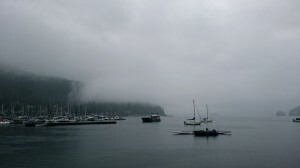 The water was still and glassy, and thick mist drifted through the pines that surrounded the cove. Now was the time to get our kayaks and pack them with our gear, the rain had eased off a little. Gareth and I went for a double kayak, and although I didn’t believe at first that everything would fit our bags and camping gear packed neatly into the waterproof compartments. 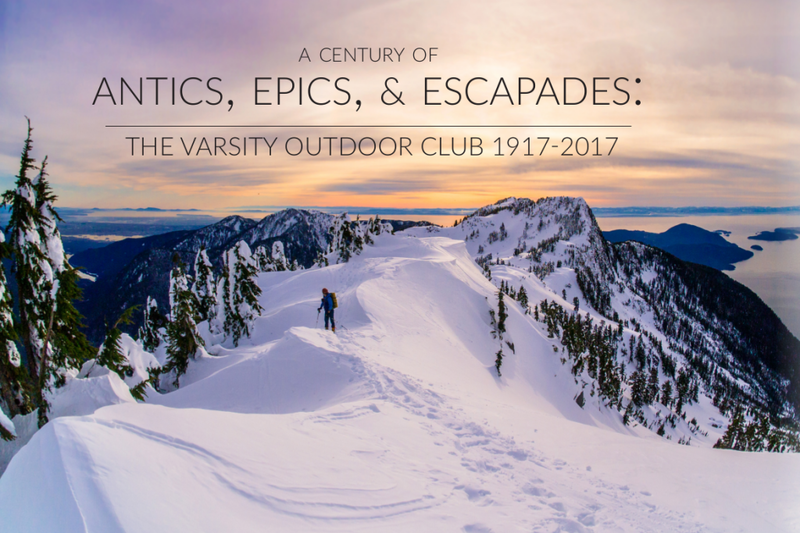 We introduced ourselves to our fellow kayakers: UBC students eager to get away from campus life and into the wild landscapes that British Columbia has to offer. After a short and informative Kayaking 101 course from Koby and Krista we all helped each other set off into the water. Remembering what we had just learnt Gareth and I dug deep into the still waters with our paddles, our rudder keeping us on a straight course. 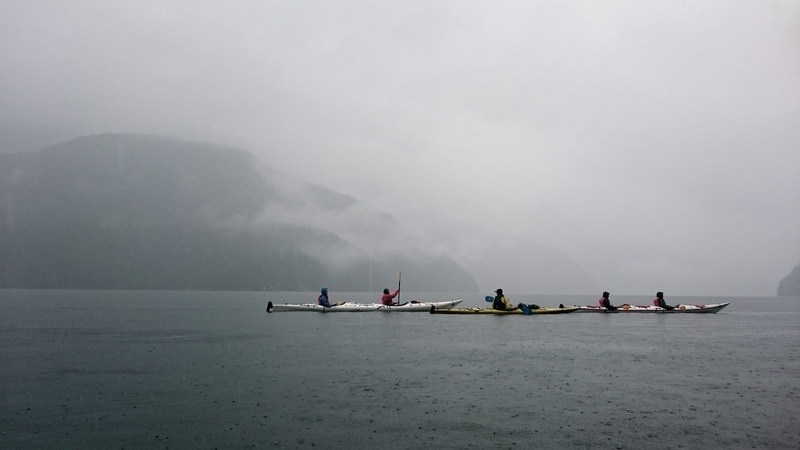 The plan was to paddle up Indian Arm, an ocean inlet that snakes northwards out from the east side of North Vancouver. After eighteen or so kilometres of paddling we would reach Granite Falls, camping there for the night before making the return journey. As the rain started to fall hard once again I began to realize that the warm and dry comfort of a tent and sleeping bag was a long way off, but I didn’t care. The fresh morning air, the dark blue expanse of glass that surrounded our kayak, everything filled me with exhilaration as my body adjusted to the rhythm of paddling. After a while kayaking out past mountains blanketed in dense evergreen forest, we catch sight of something across the water. Nestled at the foot of the slope opposite us was a lonely grey building. Koby tells us that it’s an old power station, and our group decides to go get a closer look before stopping for lunch. Checking for any boats before making our move we struck out into the middle of Indian Arm. The water was choppier than it had been whilst we were keeping to the land, slapping against the side of our kayak, and our arms and legs are stiff once we reach the station. With a solitary bird perched on top and a large metal fan rotating slowly next to broken windows the power station looked ominous, straight out of a David Lynch film. The Buntzen Generating Station has sat gazing out onto the waters of Indian Arm for over a century, and it used to provide power for the streetcars of Vancouver many years ago. Sat bobbing next to this industrial giant we felt insignificant as the rain poured down. Time for lunch. We headed back across the water to a rocky beach, helped each other haul our kayaks from the water and ate some much-needed food. By this point we were all soaked, the rain was endless. I excavated our peanut butter and jelly sandwiches from the kayak and we stood there watching the view before us, water dripping from every part of our bodies. We must have been quite a sight: twenty wet kayakers standing on the shore in our waterproofs and rubber skirts. Not that there was a single soul to see us, the empty water stretched out before us whilst great mountains reared up on the other side of the inlet like a great green wave, its foam the pale mist that threaded through the trees. Dancing and shaking to get the blood flowing again we pumped the mass of water out of our kayaks and set off again into Indian Arm. Paddling past rocky outcrops crowned by pines the ceaseless noise of rain would be cut through by someone calling out: “seal!”. Sure enough the dark eyes and domed head of a seal would emerge from the depths and watch us intently. The hard work of paddling would be made easier by such sightings, and Alice and Diane in the other twin kayak soon broke off ahead scouring the water for life. After a few more seal sightings they began to wish for whales, and then unicorns. Weird. No unicorns were seen, but as we paddled alongside more forest Gareth pointed towards a white dot in a tall, thin tree. A bald eagle watched silently over the water, stoic and regal in the unending rain. I had lost track of time by now, but knew somehow that we would be nearing our destination soon. Someone up ahead called out, they had just turned a corner round the land we had been following. As I neared the edge I could hear a rushing sound, and this soon turned out to be Granite Falls in the distance. The heavy rainfall had turned the waterfall into a roaring white beast. We had made good time, and decided to kayak further upstream at the end of the inlet. Arching trees line the banks of the river, dripping with moss. Rushing streams run over rocks to join the river; possibly a favourite haunt for bears to find fish, but not today. We paddle back towards where we’ll be staying the night, tired and wet but happy. With our kayaks neatly lined up on shore it’s a race against the weather to get our tents set up. I unroll my sleeping bag and mat inside mine and Gareth’s tent, thankfully it’s still dry. The trash bags do work. Alice and Harriet soon found this out too, using the trash bags as impromptu waterproof clothing to wear: the height of campsite fashion. After drying off slightly it was time to get dinner ready. Under a tiny tarp our team gathered around a log we had hauled over to serve as a table for our pot luck dinner. A full banquet of food is produced and everyone helps themselves to pasta dishes and salads, followed by cookies and brownies. Having eaten our fill and done the washing up Gareth and I returned to the tent, played some cards with the girls and then fell asleep to the the rushing sounds of the rain and the waterfall. We woke early the next day feeling well-rested. The rain hadn’t stopped all night. Almost as soon as we leave the tent we are soaked again, so we have a quick breakfast and get out on the water. 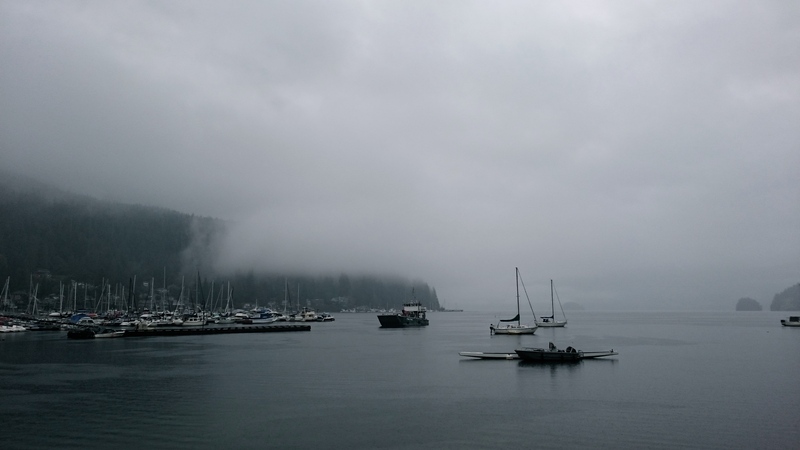 The weather is even worse than the day before, rain lashes down on us and the waves rock our kayaks, but we paddle on. Out in the open the mist closes in: we end up kayaking across a giant monochrome Rothko painting. Guided by our team leaders we make good progress regardless of the conditions, eventually paddling around the islands and outcrops we had passed yesterday. Eventually I see that lonely power station once more, and know that we are on the home straight. For the first time on the trip the rain recedes to just a light drizzle. The water is calm once again as we make our return to Deep Cove. Hauling our kayaks onto shore one last time we unpack our boats, weary but revitalized by our time out in nature. As we get the car ready to leave the first real sunshine in over two days beams down on us, but although we had been soaked through on our trip I wouldn’t have changed it for anything. This entry was posted in Paddle, Trip Reports and tagged 2wd, autumn, Granite Falls, Indian arm, Mid Group, paddle, rain. Bookmark the permalink.